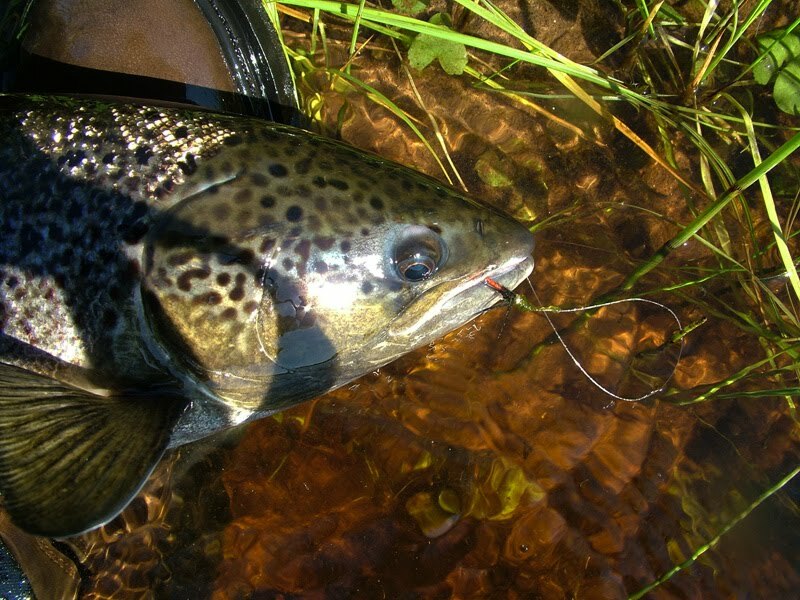 Probably, technically catching on wet flies and nymphs has advantage over giving of purely salmon flies. Giving and the bait conducting, by sight many where it is more important than the fly of its, especially, such private characteristics mentioned to a place and not so, as material game, a silhouette, colour, a transparency and many other things. In many respects working methods depend on density (floating - sinking) of line. Increase of weight and power of salmon tackle results, with rare exception, in restriction of quality of possession of it. If to spread out conducting to components it is necessary to throw, result precisely a fly into position, to process the area or a direction, without losing control over a front sight and in due time to define contact. Control which allows to translate all other qualitative parties of conducting in a quantitative indicator - time of correct work of a fly in water is key. Experience of catching by a wet fly offers these purely technical advantages correct cast and the subsequent control of position of flies. For some it sounds is paradoxical, but rather short cast can be much more productive, especially in hands of the people who have not seized tops of shooting or a two-manual casting. It is quite probable that it is necessary to appreciate more not range cast, not superfluous 2-3 metres which certainly can sometimes play a role. It is more important to pay attention to a correct variant of a direction, speed of conducting and correction of movement of a fly. And for catching it would be desirable to approach to a choice of flies more logically and consistently. Practice of replacement of the "become familiar" fly on the new bears to a little simplified approach to a problem of fish activity. The flexibility of tactics leading to success, consists not so much in search of the flies quickening interest of getting tired fish, and in search of real model of a fly and its adequate presentation in water, after all the receptions usually used on our rivers, work and on the salmon. Leah you agree, that on salmon rivers grayling attacks are good sign confirming a correct choice? Absence of attacks not only salmons, but also graylings sets thinking and change a fly. This supervision happens correct for salmon flies (let not for fully dressed, waddincton and super large tubes), especially it is correct for the usual. That is, I offer possibility to be beyond the scheme based more on aggression or seasonal "activity", in traditional sense of this word, because of the inconsistent dogmas connected with it. And to use much more clear component in behaviour - an eating instinct and near realistic flies corresponding to it. In the imitating approach there is nothing new, at catching of a salmon expressly or by implication it is applied for a long time. After all the speckled feather gives effect of segmentation, wool is similar to short moustaches and aerials craws, topping a gold pheasant creates illusion of a contour of a translucent body. Many flies have passed from a number realistic trout, let the generalised imitations, in the salmon. Remember at least March Brown and Muddler Minnow. Return process is swept up also. Some salmon flies leave a category purely salmon. Losing in paints and decreasing in sizes, they, thus, come nearer to the natural prototypes stimulating appetite, instead of playing nerves. Estimating efficiency of flies, I want to result their indicative degradation on the river (for example, during summer season) from purely salmon to usual, let sometimes fantasy, but more often close in realistic products. I already have teleologically decided to go deep into minimisation of the size of flies, it is interesting after all to find a limit or the line defining preference of fishes. Eventually, I have left alone everything that though somehow reminded salmon flies, and have passed to variants Red Tag or Black Zulu # 10- 12 in which the scrap of red wool, as a rudiment of a former charm of a salmon fly was saved only. 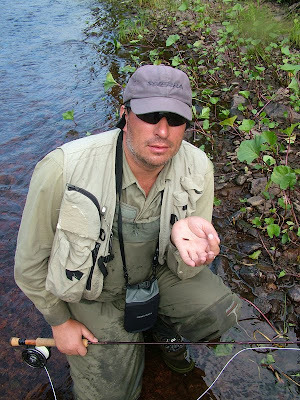 It was necessary to stop on absolutely small wet flies with a red body of type Red Spinner, Hardy Favourite or, we name them so, «Bloody Gnat» under a full mosquito with a paunch from bright red to a cherry, bloody shade on 12-14 numbers of hooks. Still being very cautious, I could not refuse from "red", in any degree assuming its role in salmon interest.